several dark lanterns, while Legrand brought with him only the bug itself; he carried it tied to the end of a long piece of heavy cord, and he swung it around through the air, as he went, like some man of mystery. When I saw my friend doing this, I could only think that he was completely out of his mind. I almost burst into tears. parently made on some earlier visit here. In this manner we traveled on for about two hours. The sun was just setting when we entered a section even more un­pleasant looking than any yet seen. It was a kind of flat table­land, near the top of a hill which had very sharp sides. It had been most difficult to climb this hill. The trees and bushes grew very thick on its sides. There were also large stones lying everywhere. These were held from rolling down the hill by the thick bushes and heavy trees against which they leaned. How far up must I go, Master?” asked Jupiter. “What’s the matter now, Master?” said Jup. “You’re always getting mad right away with me. I was only fooling anyway. Me afraid of that bug? What do I care for the bug?” Here he took careful hold of the end of the cord and, keeping the bug as fâr away from himself as the circumstance would permit, prepared to go up the tree. The tree was not hard to climb. Though the trunk was large in size, it was very rough in certain spots, giving Jupiter a chance to take hold with his hands or rest his naked feet in these places. After one or two narrow escapes from falling, he succeeded at last in getting part way up. He was, in fact, now some sixty or seventy feet from the ground, and seemed to think that his work was well completed. said Legrand. Jupiter followed his orders at once and appar­ently with little trouble. He continued going higher and higher until he could no longer be seen through the thick branches and heavy leaves of the tree. Soon, however, his voice was heard calling to us. A. 1. Why did Jupiter carry the axe and shovels? 2. What did the author take with him? 3. How did Legrand carry the bug? 4. How did Legrand answer any questions about the trip? 5. Where did they go? 6. What did Legrand now and then stop to examine? 7. How long did they travel this way? 8. Describe the hill they climbed. 9. What was at the top of the hill? 10. What did Legrand direct Jupiter to do? 11. To what did the path that Jupiter cleared lead? 12. What did Legrand ask Jupiter if he could do? 13. What did Legrand want Jupiter to take with him? 14. Why was the tree easy to climb? 15. How high up in the tree did J upiter climb? In a few minutes Jupiter’s voice was heard again, saying that he had reached the seventh branch. By this time what little doubt I had about the condition of my friend’s mind was put to rest. There was nothing else to believe except that he had gone completely mad. I began to worry about how to get him home. While I was thinking of the best way to do this, Jupiter’s voice was heard again. “Did you say it was a dead branch, Jupiter?” cried Legrand, his voice shaking. “What in the name of heaven shall I do?” asked Legrand, seeming to be very greatly worried. During this conversation Jupiter was completely hidden from us by the leaves and branches of the tree; but the bug, which he had let drop, was now to be seen hanging at the end of the cord. The gold of its body shone in the setting sun. The bug hung quite clear of any branches, and, if permitted to fall, would have fallen at our feet. Legrand immediately took the axe and with it cleared a space, in the form of a circle, about three or four feet across, just below the place where the bug hung. Then, having done this, he ordered Jupiter to let go the cord and to come down from the tree. Driving a stick of wood into the ground with great care, at the exact spot where the bug fell, my friend now took from his pocket a measuring cord. Fastening one end of this measuring cord at the point of the tree nearest to the stick, he unrolled it until it reached the stick. Then he went on to unroll it still further, in the direction already established by the two points of the tree and the stick, for a distance of fifty feet. Jupiter, meanwhile, cleared away the bushes with the axe. At the spot reached in this way, a second stick was driven into the ground, and about this stick, as a center, a rough circle was drawn— about four feet across. Taking a shovel himself and giving one to Jupiter and the third one to me, Legrand asked us: to set about digging as quickly as possible. A. 1. After Jupiter had reached the seventh branch, what did Legrand tell him to do? 2. Why was Jupiter afraid to go so far out on this branch? 3. What did the author then say that Legrand should do? 4. What did Jupiter find when he tried the wood with his knife? 5. What did Jupiter suggest that he drop? 6. What did Legrand promise him if he went out on the branch? 7. What did Jupiter find at the end of the branch? 8. 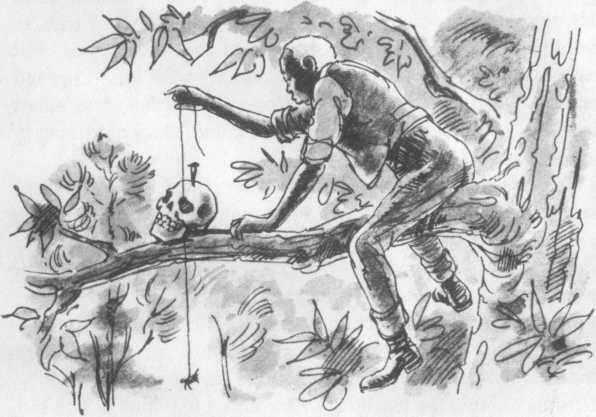 How was the skull fastened to the tree? 9. How did Legrand tell Jupiter to find the left eye of the skull? 10.What did Legrand tell him to do with the bug? 11.What did Legrand do when the bug was hanging clear of the branches? 12.What did he then order J upiter to do? 13Describe what Legrand and Jupiter did next.